Through an interactive workshop, participants put their ideas for what kind of city they would want to live in to the test. Photo by Benoit Colin/EMBARQ. 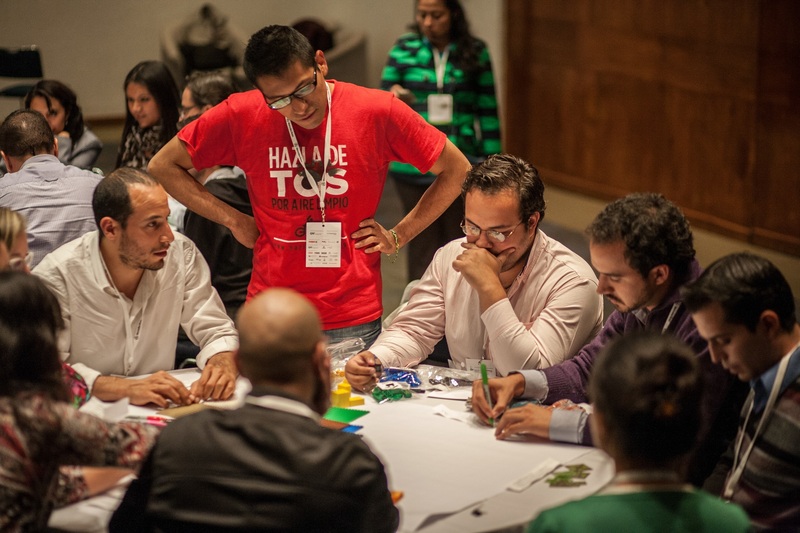 At last month’s International Congress for Sustainable Transport in Mexico City, Robin King, Director of Urban Development for EMBARQ, hosted a workshop focused on the question: “What kind of city do you want to live in?” Instead of discussing this idea in theory, workshop participants were split into teams and given an hour to design their ideal city using miniature building blocks. The game is derived from one developed by Professor Juval Portugali from the University of Tel Aviv. It is based on the premise that cities are complex, adaptive systems. Whether participants are urban planners, transport engineers, architects, or work in unrelated professions, this game helps players better understand the planning process and the forces that shape our cities. In learning from and advising cities worldwide, EMBARQ has helped develop the science of sustainable cities. Concepts such as sustainable transport, compact development, pedestrianization, and transit-oriented development (TOD) have a track record of creating livable cities with high quality of life worldwide. This workshop, however, highlighted that there is not one ideal city. Some of the participating teams were made up of urban planners that understand common concepts for city design, and share similar priorities. Still, the different groups’ cities turned out vastly different. Even when using sustainable planning practices, the game shows that tradeoffs exist in every city. For example, pedestrianized zones prohibit sustainable mass transport like bus rapid transit (BRT) in certain areas. Transit-oriented development can make housing less affordable by driving up prices as convenient locations become more expensive. Planners must constantly balance the appropriateness of different development and mobility strategies, and create solutions that fit the local context. 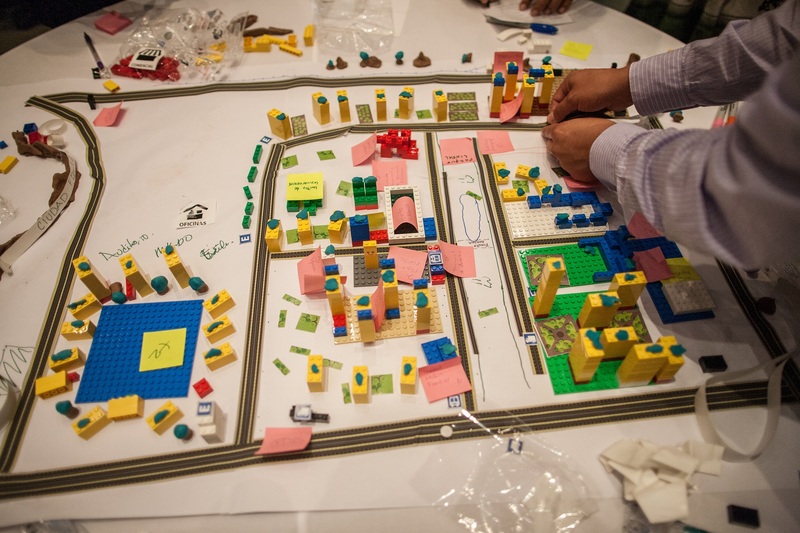 Participants used a variety of planning concepts to design their ideal city. Photo by Benoit Colin/EMBARQ. Urban planning is an inherently interdisciplinary process. In addition to planners, it often involves transport engineers, private businesses, architects, real estate developers, NGOs, local residents, and many others. This workshop helped show how people with different backgrounds have a different focus when shaping cities. Each perspective has an important role to play in shaping our cities. Planners may have a better sense for integrating the local environment. Transport engineers can better understand the feasibility of different projects. Citizens may know best how the change will affect life on the ground. Each of these groups, and many others, bring unique perspectives to the planning process. While a variety of perspectives can benefit city planning, it also creates challenges. As part of the game’s rules, members of some teams were assigned roles with varying priorities. Participants quickly understood the difficultly of working with participants with conflicting agendas. This highlighted an essential aspect to planning worldwide: compromise. With many voices, it is crucial to find common ground between all sides in the planning process. Teams had to reconcile varying agendas when planning their cities. Photo by Benoit Colin/EMBARQ. Planning great cities is not a straightforward process. Even when designing a theoretical city with an unlimited budget and without the challenge of existing infrastructure, planning is a negotiated process that requires collaboration and cooperation. Participants of all backgrounds left the workshop with a better understanding of what it takes to shape cities.